I'm really excited to show you this tutorial today, because it's so fitting for the season, and also....EASY AS PIE. PUMPKIN PIE. 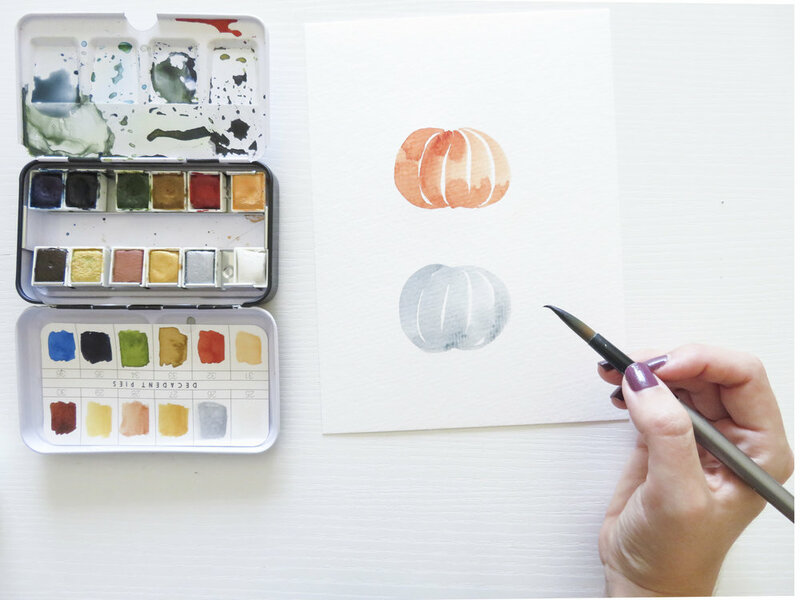 These watercolor pumpkins will blow your mind! Get ready to paint a million pumpkins today. It's addicting! You can also skip ahead to the end of this post to see a video demonstrating this technique. Watercolors (I'm using the Prima Decadent Pies Set, because they have a ton of great Fall colors. If you don't have a set like this, all you really need is an orange! I'm also going to mix up a blue, gray, and green to create a beautiful blue pumpkin later. 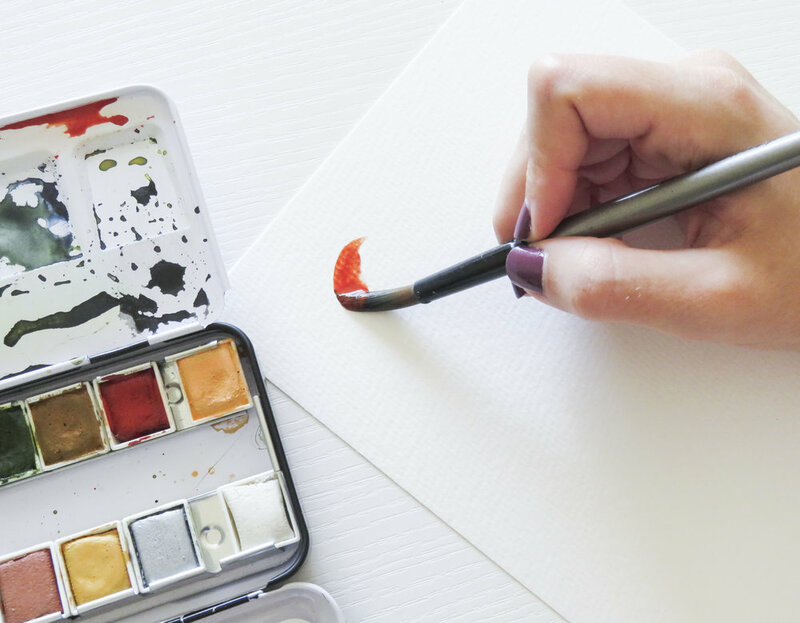 In the video accompanied with this post, you’ll see I’m using super cheap watercolors…you can really use whatever you have on hand. Watercolor Paper (I'm using The Hobby Lobby brand of cold-pressed paper cut down to 5x7 size. A cup of water ---mine had already been used to practice some pumpkins so it looks gross! Oops! A paper towel for blotting your brush if it gets too wet! I'm using a large round brush (I believe it's Size 12) for this tutorial. This is one of my favorite brushes ever--I think I picked it up at Michael's? Either way, I love this large size because I can get really thick, beautiful brush strokes...as you'll see, they totally bring the pumpkin to life. If you want to make daintier pumpkins, you can size down to a smaller brush, using the same brush strokes. The important thing to remember is that you will need to use a ROUND BRUSH to achieve these brush strokes. As for the colors, I'm using the rusty-redish-orange color seen in my palette. It's the perfect pumpkin shade, which means no mixing for me, which I love. I've got my brush pretty saturated with water so I can get a lot of pigment from the orange color, which creates gorgeous textures. 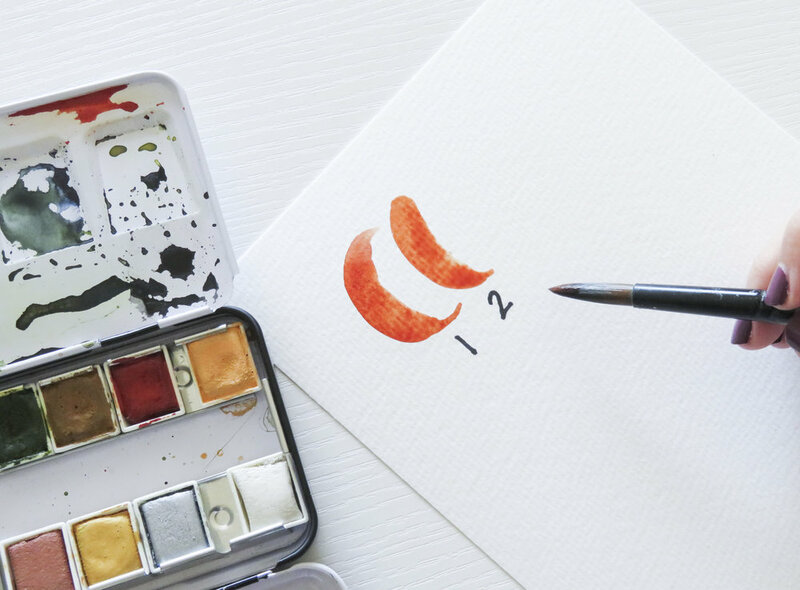 You can see more about this in a previous post How To: Watercolor 4 Fall Leaves. 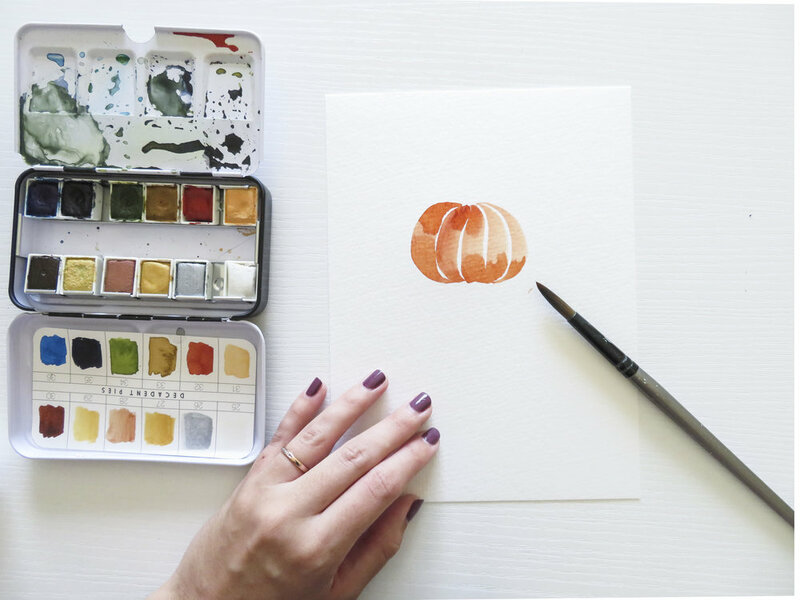 Like I said, all you need to know are 5 brushstrokes to create a beautiful watercolor pumpkin. I'm going to show you those strokes....feel free to practice with a pen or pencil before you are ready to try with your brush. We're starting from the left and moving right. The first stroke is a 'C' shape, just like this one. The next stroke is similar to a C, but not as dramatic. The third stroke is basically a straight line. For the last two strokes, you're going to do a mirror image of the first two. 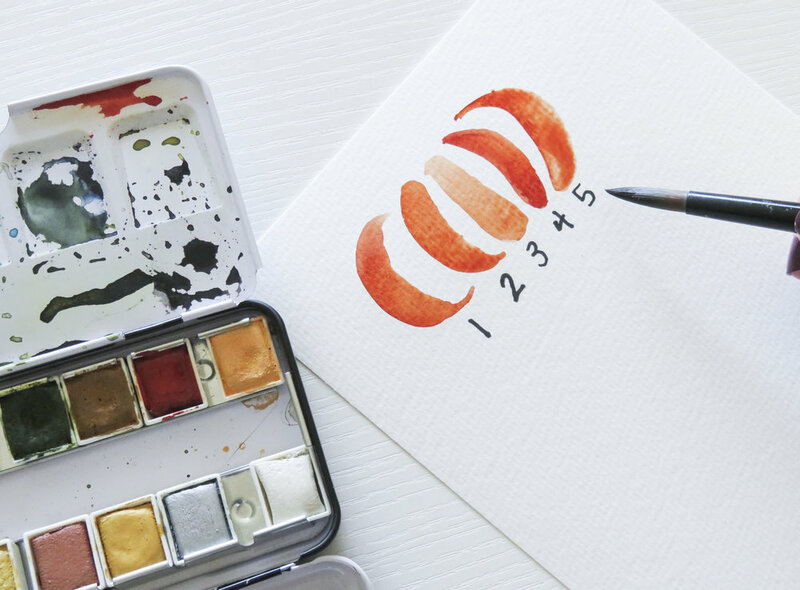 These are the five strokes you need to create a really beautiful watercolor pumpkin! Now, let's mush them closer together, and watch the magic happen! 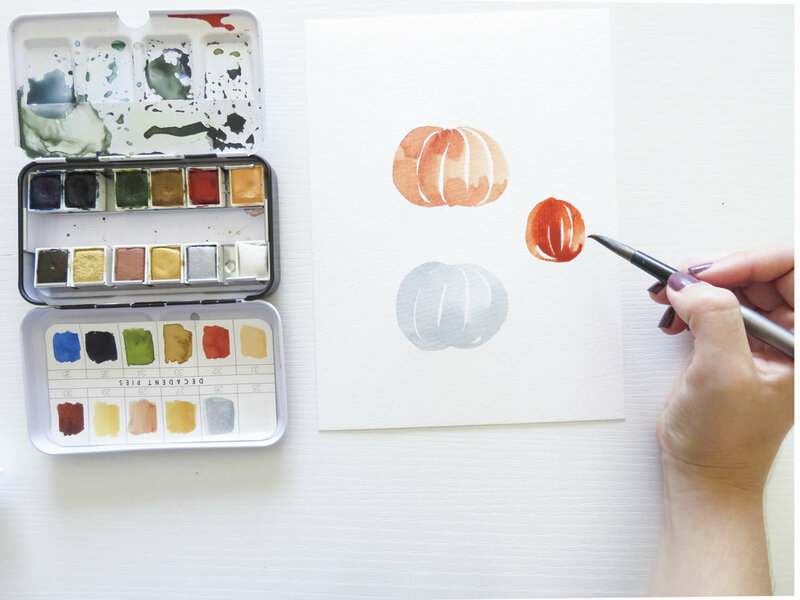 The only 'trick' when painting these shapes closer together is adding in some extra connections at the top and bottom to give your pumpkin a more 'painterly' look! Also, depending on how wet your brush is, your shapes might bleed into one another, and that is totally fine! In fact, I think it looks awesome that way! For this pumpkin, I mixed up a grayish-bluish-greenish color. I just LOVE a dusty blue pumpkin in the fall, so I was extra excited about this one. I used the exact same strokes to complete this pumpkin! This pumpkin looks a little different (because, not all pumpkins are the same). All I did for this pumpkin was to make it 'skinnier.' It is also more saturated with color, so it looks a little more 'artistic,' but that just gives it character! For this last pumpkin, I went back to the dusty blue and I got a little cray-cray with my strokes, just to show that you can be really loose and imperfect with your brushstrokes and still achieve a gorgeous pumpkin! Finally, LET'S FINISH THESE BABIES!!!! Don't worry---finishing touches are just as easy as the pumpkins themselves. Grab a brown, and paint the pumpkin stems with literally one stroke!! Feel free to experiment with the way your stems look, like I did. You really can't go wrong with a stem. This last step is totally optional, but all you have to do is use the thin end of your round brush to paint these little green squiggles (what are these things called in real life?) coming out of your stem. Seriously, I can't get over how easy these are. Are you going to try these pumpkins? Let me know how yours turn out in the comments below! Also, let me know what else you want to see in a 'How To:' tutorial.